Excellent delivery and price,would recommend You to all. Excellent service from Tayna - telephoned one day and got batteries the next day. Really efficient and helpful when I telephoned - well done! Excellent support and information, quick delivery, we are delighted on every aspect of this purchase, have already placed my next order for a car battery based on this experience. 5* service,excellent comms,very fast delivery.Will use again. I brought these as a far cheaper alternative to the APC RBC7 battery pack from APC. Saved myself almost 50% (cheapest price) of the cost and I got an additional 20% runtime out of the deal!. 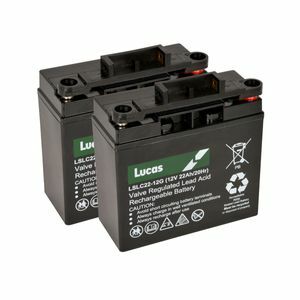 These Lucas batteries are far better equipped to deliver the full load current (43.5 Amps) of my UPS at max output 988 watts. The APC 12 Volt 17Ah battery drop test topped out at 63 Amps before The voltage dropped below 11 Volts, but these Lucas 12 volt batteries kept going to 76 Amps peak. True they have a better Amp-Hour rating for the same foot-print over the APC (Unbranded) version, but it allowed my UPS to run another 9 minutes after a full mains failure. From selection to purchase, it was straight forward although the battery tech stuff needed a visit to the Lucas website. I was shocked how quick and punctual the delivery was too (1 day). What really made me a happy bunny was the level of packaging they came in.... Top service, top price and top hole Tayna! If you are due to swap your old UPS batteries, come here first! Saves you at least half the price and you can find a better replacement if you know what your doing.